This one started out as an attempt to create a "hero tree" (basically a very complex foreground object as opposed to a simple background object) using my Plant Factory software. The background mountains were created using World Machine and my work on them lead to the creation of my Autumn Cliffs render. I really love your pictures that are based around trees. Especially the ones featuring the same scene during the different seasons. "The Light and the Storm"
I LOVE this. This is that perfect, split-second moment of sunlight while a storm is rolling in -- I've seen it on our farm over and over. Everything behind it is black and all the light just saturates this small space in front just before the clouds slam shut and the lightning and thunder start. The dappling on the grass is great foreshadowing. This one leaves me breathless. Well done! I like the scenery itself, especially the tree, but I think softer lighting would suit it better; the green of the grass and the red and yellow of the leaves look unnaturally saturated in the bright white light, and I'm not entirely sure where the light is coming from in the first place since the sky is so dark and there's no lamps or anything in the scene. Absolutely drop dead gorgeous my Last Name means "Autumn" in German so this is my theme for a long time. "Always loved this particular picture." And this version is no exception! It's awesome! It reminded me immedeatly of "Red and Gold" from 2008, which I like much better. This one just looks somehow unnatural to me. - I don't really know what it is, but I noticed this in a lot of your newer works. It is also true for "Above the Canopy" and your recent "... Cliffs" series. - But not for "Valley of the Stars/Sun", they are fantastic. This is one of the first images I download every single time I get a new digital screen of any size. Whether it's on my phone or my new 21:9 ultra widescreen. I'm grabbing some wallpapers for my new screen but just had to comment. The whole series of images with the hero tree is great.There is a wonderful sense of movement in this one and the colors are great too. I really like the contrast of bright green and the autumn colors. but on dual screen the poor tree is cut in half. I love the dual screens when you place the feature object, area or item offset so it will be on one screen. I love it when you solo out a singular item like this tree. You have a knack for beautifying anything! ...how much your work pops. It's like looking at Blu Ray instead of standard DVD format. Been following you since the 90's =) Better late than never? Just the right mix of color, depth, changing landscapes, everything that symbolizes October - One of my all time favorites! Thank you! This one is really good. But it would be nice if the sky was lighter... more dawn/dusky and less cloudy. A pickle jar render maybe? I don't think I've ever commented before but this one's pretty awesome. The haze and the shadows in the background complete it. Fine work! I really like this one, particularly the bright saturated colors. It's autumn-y, but not dreary. It looks absolutely spectacular on 3 monitors! I'm continually amazed at how you surpass yourself with each new piece. Bravo! This reminds me of Red and Gold which has been hanging in my living room for 4 to 5 years now. Maybe I can put this one on another wall if it ever becomes available as a poster. Wow, three new images for my favorite season! All are great, but this one really rocks. Love the colors -- it looks fabulous on my screen. Thanks, Ryan! A fantasy with a riot of vibrant colors. Perhaps Bilbo Baggins likes the Shire so much! Well done! "Not just a walk down Memory Lane..."
...while inspired from "Red and Gold", it is also new and original. Colours appear a bit over-saturated (?) but still I like it a lot! Love the outdoor scenes and I love fall...Homerun! Wow, another winner! I love this! It makes me feel like I'm in the moments before a storm. Straight onto my dual monitors! This is a nice render but I have two vertical Portrait monitors on each side of my horizontal Landscape monitor. It would be nice to have all renders with a Portrait resolution 1200x1920. I'll be honest I haven't liked the last few renders. However, having been a decade member I know better. Eventually one grabs my eye and more importantly my emotions. The lush green and foreboding background are compelling to look at. I tip my hat to this one. This my be my favourite of the year from you, Ryan. I love it! The colours are bold, the scene is majestic, and it's simply remarkable! Thank you again for your outstanding work! I love this!! Beautiful Autumn color. 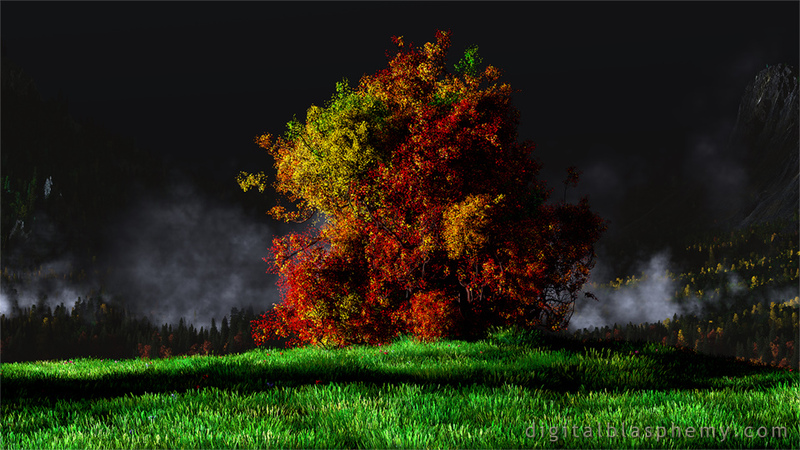 I like the fog and dark behind the tree and grass because it really makes them pop. This immediately went to my desktop. "shades of Red and Gold"
first thought was: "wow, love the update to Red and Gold", a little closer inspection made me realize it's not the same tree. but i do really like it. i think it's going to replace my red and gold currently on my background! This is a really beautiful render. It's sure to be one of my seasonal favorites!!! I absolutely LOVE it! The color and light contrasts are exquisite! The approaching winter-ish background is wonderful. "Green and Gold, Red and Gold, now Shades of Autumn"
Autumn is my favorite time of year - football, Halloween, perfect temperatures, and the best DigitalBlasphemy pics. Keep up the great work! But... it's too dark behind the tree. 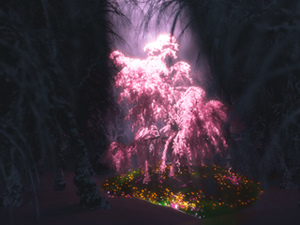 "Too much fog on single screen"
While it looks nice in the multi-screen versions, the fog behind the center tree looks a little overwhelming on just the single screen version. Otherwise, pretty cool update. Hope we get seasonal variants of this one too. Red and Gold is one of my favorites (printed and hung in my living room) - but this is a GREAT update! Really nice, the grass is a great touch. @Robert, I disagree the area around my house is in full autumn mode and the grass is still as green as a midsummer's day. I love how the entire back is a foreshadow of winter yet fall is still fighting to hang on. Well done.